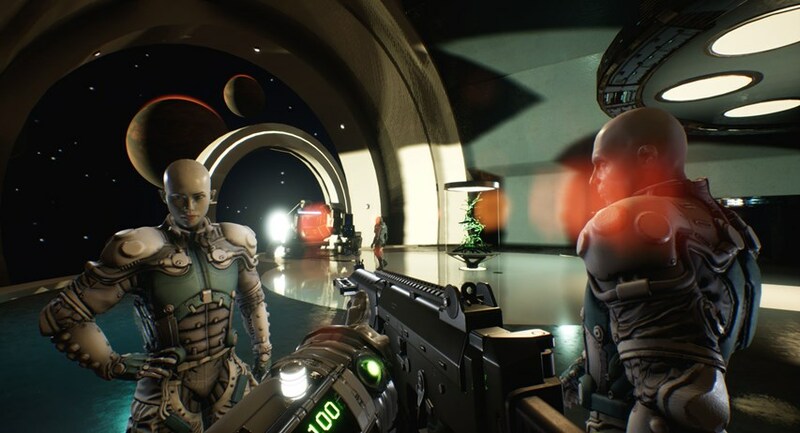 Team 17 and developer Radiation Blue released Genesis Alpha One on consoles and PC. Previously a Steam only title, but switched to the Epic Games store until this time next year that is. The story is fairly straight forward, search the galaxy for a new home given that war ravaged existing comforts and the human race faces extinction. Your job as commander of a Genesis ship is to find a habitable planet and settle there. Sounds easy enough right? Genesis Alpha One fuses a number of game styles into an amalgamation of ideas. Part rogue-lite game, first person shooter, management sim it’s all here for the taking. What starts out as a simple build a spaceship with parts, turns into a fully fledged operation for survival. Players construct their ship, then head out into the expanse of space looking for resources on planets and generating crew members. A distinct balancing act takes place with regards to the ship’s generation of air and material versus the usage of the crew. Players explore on planet surfaces for resources either with AI companions in tow, or leaving them to do it themselves. With enough components, refined or stored, new cloned crew members add to the manpower. As captain, you assign crew members duties on board the ship. It’s all rather peachy to begin with until the cracks start to appear. Starting the game is child’s-play and whilst it appears a little daunting at first, with limited experience players can survive quite easily. However, once exploration extends beyond the initial ship construction and players interact with the outside, the dangers appear. Early on a tractor beam collects resources from outside the ship, however this adds the threat of aliens boarding. This isn’t a massive problem at first as the tiny critters blow up easily with a few shots of a pistol or rifle. Progression further into the galaxy presents extremely dangerous foes though who overun the ship and kill all the crew. That’s a game over moment right there. Players build defences with turrets and shields, armed crew members patrolling rooms and then of course your character can intervene at any time. What is perhaps unfortunate is despite the defences the game feels like it needs your interaction at all times. You can’t just leave the AI to do all the work as you might expect. Turrets accuracy is pretty poor for example which leads to a secret alien infestation under the ship’s floors. Before you know it, the whole ship is under threat from extinction. The same goes for landing on planets gathering resources. If left to the AI it’s almost a guarantee that some unwanted lifeforms join the party. Space is a dangerous place, as you warp from one system to the next. Luckily the threat level shows on your scanners which helps to steer you away from risks. But to succeed, it’s not always possible to avoid conflict and danger such is the nature of the beast here. Visually, the simple graphics function well enough giving the entire game an old school flavour. The aesthetic works well enough but is quite basic by today’s standards. That said, some randomized elements throw in surprises along the way at times which is good. In terms of performance, on PC at least the game feels well optimised at higher resolutions. The shooting, whilst basic works well enough. However, due to the nature of the visuals, the benefits of cranking the resolution to 4K isn’t as impacting as expected. A number of options present themselves to suit individual set ups which is handy for tinkerers. Audio takes a back seat here as a functional set of sci-fi themed sound effects and music. Players unlock new starting items from previous plays once specific criteria is met. However, due to the difficulty and random element it’s a tough campaign once the hours rack up. Death and starting over is an eventuality, so it’s really down to the player’s resolve as to how much millage they will get here. If you’re well accomplished with rogue-like games then starting again with renewed vigor is par de la course. Other players might view the design as frustrating. With the random element making each play somewhat different, players can come back for more as and when. Genesis Alpha One offers an interesting sci-fi themed game. The interface is easy to navigate, the premise simple enough for anyone to pick up and play. However, it’s certainly a game for specific tastes. Those looking for a straight-up action shooter need not apply, and those who just want to manage make things tougher for themselves. You have to embrace all the features to get the most from it. Still, if you “get” what Radiant Blue designed here, then fun, tense and frustrating times are in order. Now let us get back to our all female crew of aliens. So much for saving humanity!